TOKYO — Led by a congratulatory tweet from the prime minister, Japan reveled in Naomi Osaka's dramatic Australian Open win on Sunday. Osaka beat Petra Kvitova 7-6 (2), 5-7, 6-4 on Saturday to claim a second consecutive Grand Slam singles title. The 21-year-old Osaka also became the first tennis player from Japan to reach No. 1 in the rankings. Osaka was born in Japan — her mother is Japanese, her father is Haitian — and she moved to New York at age 3. "What an impressive performance," Japanese Prime Minister Shinzo Abe tweeted. "Congratulations to Naomi Osaka on winning the Australian Open! " Osaka's grandfather, who lives in the remote fishing village of Nemuro on Japan's northernmost island of Hokkaido, said Sunday he was relieved. "My blood pressure is up," 74-year-old Tetsuo Osaka said. "I'm really proud of how she won. She is so dear to me." When asked he was going to give her a congratulatory gift, Tetsuo Osaka said he hoped to be on the receiving end of a gift from his granddaughter now. Beyond dignitaries and relatives, average fans took pride in Osaka's win. "As a Japanese person, I'm very proud," said 28-year Satoshi Mizutani, who works in finance. "She showed a lot of character in coming back after dropping the second set. I think she is an inspiration to young people in Japan who can learn to do whatever they want if they work hard for it." Osaka has been a star in Japan since she beat Serena Williams in the U.S. Open final last year. She became the first woman to win back-to-back majors since Williams in 2015. 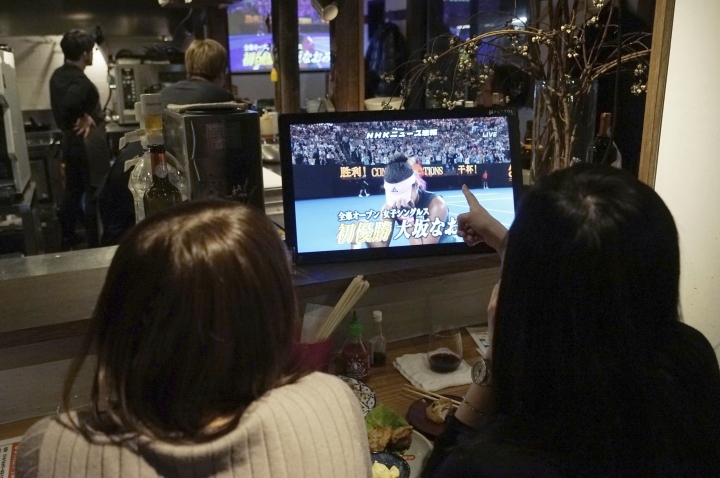 Her performance at the Australian Open has topped daily news coverage in Japan. "Osaka becomes first Japanese Australian Open champion, Heading to World No. 1," read the headline of the Nikkansports online edition. Osaka's results on the court and her quirky sense of humor have sent her popularity skyrocketing, and her list of endorsements now includes major brands like Adidas, Nissan, Yonex, Citizen, Nissin and Shiseido. Osaka's victory at the U.S. Open was the first Grand Slam singles title by either a man or woman of Japanese nationality. Kimiko Date reached the semifinals of the Australian Open in 1994, the 1995 French Open and Wimbledon in 1996 but never made it to a Grand Slam final. On the men's side, Kei Nishikori was runner-up at the 2014 U.S. Open, losing to Marin Cilic in the final. Osaka's rise to the top of the tennis world couldn't come at a better time. With the 2020 Tokyo Olympics just over a year away she could become the face of the Games. "It would be fantastic to see her represent Japan," said Daisuke Aizawa said. "I think she would be the favorite to win gold and that would be a huge boost for Japan." When asked about being the face of the Olympics, Osaka was her usual quirky self. "Yikes! if that happens, I'd be very honored," Osaka said. "Hopefully for their sake, they don't do that." AP Business Writer Yuri Kageyama contributed to this report.